A big chunk of your medical practice is managing your schedule. Couple that with multiple locations and things can get lost in the shuffle. With SeriousMD Doctors, it's as simple as 1-2-3. Your patient queue changes day to day, location to location. Easily see what's on your plate, anytime, anywhere. Manage your patient queue list with ease. Reorder your queue, skip patients that are late, cancel appointments and even indicate if you have already seen the patient. You are in full control of your process and patients are still served equally. 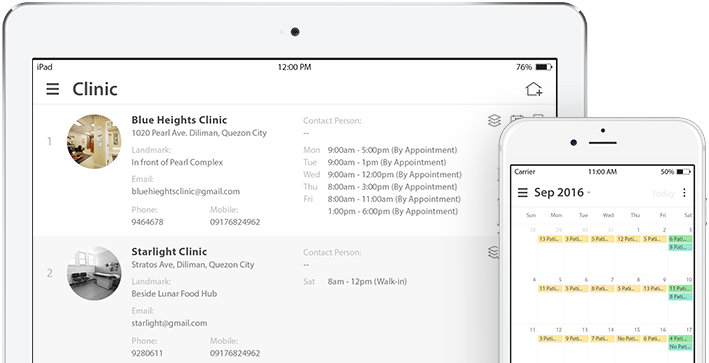 At a glance, you'll be able to see how many patients you'd need to serve today. You'll also see how many patients you've already served the past week. Ever forget where you need to be on a certain day but you need to schedule a patient? 1 glance and 1 tap are all you need. You can access your schedule through different ways, using any device you want. Integrations with your calendar app of choice? It's coming sooner than you think. Wow, amazing, actually as it is, it is already better than most EMR I tried. Getting better and better! I have been using the system for the past 2 months and i can say that I believe you have the best emr potential among all the available options. Every doctor is unique. Your setup is unique. With real-time syncing, you or your staff can update your schedule on any device. Your data is always updated wherever you are.